Ecuador is located on the equatorial line in northwestern South America, bordering the Pacific Ocean to the west, Colombia to the north, and Peru to the south and east. Ecuador is the eighth largest country in South America, at roughly the size of the US state of Nevada. Ecuador is 283,561 square kilometers in size and has a very diverse geography. Ecuador has four geographical regions: The Andes (La Sierra), the Amazon Rainforest (El Oriente), La Costa (The Coast), and the Galapagos Islands. 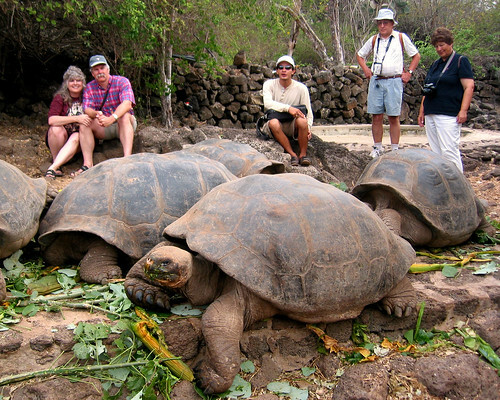 The Galapagos Islands are located around 1,000 kilometers west of mainland Ecuador. The volcanic islands have a subtropical climate and are marked by beaches and forests. During the Galápagos Islands' dry season, which runs from June to December, the weather is cooler and windier. From October to May, the weather is warmer and there is frequently light rain. The coast runs along the west coast and features low mountains, valleys, plains, mangroves, rivers, and rainforests. The coast has a tropical climate, and is hot and humid. The coast is cloudy, cooler, and dry from May to December, and hotter and rainier from January to April. The Andes region, or central highlands, lying between the western coastal lowlands and the eastern jungles, consists of mountain ranges, foothills, and valleys. The two sides of the Andes, the Western and Eastern Andes contain 60 volcanoes with an average altitude of 7,000 feet, covering a distance of 400 km from the northern to the southern Andes. This is called the “Avenue of the Volcanoes.” Due to the altitude, the Andes region has cool, spring-like weather, with a great deal of sunshine. Temperatures vary throughout the day. The highlands are overcast and wet during the rainy season (October-May), and drier, with mild showers, common in the afternoon, during the dry season (June-September).